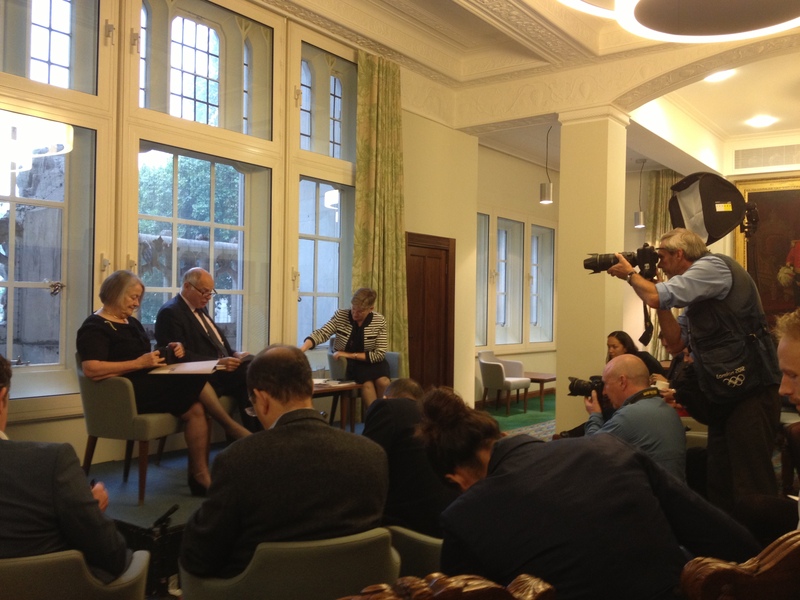 On October 2 at 10am, the United Kingdom Supreme Court held an hour long pre-term press-briefing to mark the opening of the Court’s fifth year. This blog looks not only at what was said by the Court, and asked by the journalists on the day, but also what was then reported. The Supreme Court’s relationship with the media is marked by the same combination of common interests and tensions which mark the media’s relationship with any other public body. Yes the Court wants media coverage; and a function of the media is to cover the Court. The media though will always want more than its subjects are looking to give up, and not only that, will often frame how the subject is presented according to each outlet’s particular agendas. Further, the Court, and its justices, will also have their own goals about what messages should be highlighted. That a press briefing featured in the start of year events says something about this still new court. Unlike what went before – the Appellate Committee – the @uksupremecourt has a now seasoned press office (for previous analysis see here and here). While the Court will not rival Strictly for coverage (and likely would not want to – justice, while prepared to show a little leg, still likes to maintain some mystique), its communications operation, which continues to innovate, has made it a world leader amongst top courts for transparency and accessibility. As judges we are constrained in some respects as to what we can discuss. For instance, it is inappropriate for judges to give opinions publically on political matters save in so far as they impinge on the rule of law. We have to be wary of expressing views on issues which we may have to decide in due course in court. His remaining remarks reviewed the number of cases decided since October 2012 (82), and highlighted a selection before closing with a paean to the importance of open justice, including discussing elements of the Court’s communications innovations. Lady Hale, still, remarkably, the only woman on the Court noted some of the forthcoming terms “highlights”. There’s a curiosity here, almost all cases require leave, and must therefore be “Supreme Court worthy”, and yet this trailing of cases the Court considers likely to be of greater public interest gives us a new gloss on the leave process: the “super-Supreme Court case”. Lady Hale closed with a reflection she must be tiring of making about the lack of women on the Court, and the need for greater diversity in the judiciary generally. It was a reflection though which, as we shall see, made for good press. I am now doing what I said I would not do – picking up on Joshua’s point… if we did not have the Human Rights Act, the common law might develop in certain directions to accommodate a degree of change because the common law does change with the times. How it would change and in what respect is pure speculation. The subtle message being sent by the President that repealing the Human Rights act might not be the last word on human rights principles appearing in Supreme Court jurisprudence was not one which lent itself to an easy headline (the discussion was really only covered by the UKSC blog); the skill was in putting the idea on the record without providing material for “Supreme Court responds to Tory plan to scrap Human Rights Act” type coverage. And indeed, Rozenberg chose the elements of the briefing touching on open court processes for a subsequent Guardian piece. Francess Gibb of the Times was called next and followed up Lady Hale’s comments about diversity – an issue she did choose for one of her subsequent reports, the others highlighting the concerns Lord Neuberger raised over legal aid, and the Court’s openness agenda. David Barrett of the Telegraph followed up on diversity asking Lady Hale whether she still did not favour positive discrimination (she does not). Barrett’s story on the topic ran under the headline, “Top female judge questions male ‘dominance’”. The other story Barrett chose for print concerned a series of comments Lord Neuberger made about the importance of open justice. Jack Doyle from the Mail then followed with a question about the wearing of veils in court rooms, including whether the Supreme Court would allow veiled advocates before it – a question which the President chose, in his own words, to “duck”. The veil question did not headline in Doyle’s coverage (though it did make the Express). Like others, one of Doyle’s subsequent pieces also pursued the theme of judicial diversity, “Women not being made top judges because men ‘dominate’ the selection process, says Britain’s only female Law Lord.” Another “’I welcome increased openness unreservedly’ Supreme Court judge’s praise for Mail’s open justice fight”. While both headlines had a basis in what had been said by the two judges, both were the most tendentious of all the subsequent coverage. The open justice theme in particular being linked to a wider Mail campaign about openness in the justice system per se. Rights, whether human rights or other rights, are valueless if they cannot be enforced in court. Reductions in legal aid therefore inevitably cause one concern. … I think that legal aid cuts therefore do cause any person concerned with the rule of law a worry. The President did couch his concern in an explicit acknowledgment that difficult economic times have to be taken into account; referring back to his opening comments, he provided more of an insight into his view of the wider role of a lead judge, “one of our functions is not merely to sit in court, but also to support and ensure the rule of law.” It was a potent point, subtly made. So far I have only mentioned press coverage. The only other media coverage I found was on Radio 4’s 6pm news which picked up Lady Hale’s comments about the lack of female appointments to the Court. Standing back then, what comes through? First, the event resulted in no media “gotchas.” In particular neither what was said about the Human Rights Act nor legal aid were written up in any sense as “judges criticise government (or Conservative party) policy”. Partly I suspect that is because the judges did not give their audience any suitably juicy sound-bite. Second, there were clearly other issues running of potentially greater controversy on which the press wanted comment on the day: specifically, veils in court, and general concerns about the openness of judicial processes. The stand-out message emerging from the exercise though is that despite 13 appointments at the Law Lord level since Brenda Hale was appointed 10 years ago, Lady Hale remains the lone female voice on the UK’s top court. Lady Hale can take only some of the credit for this point dominating the next day coverage (including comments which made it online in video form). What actually gets covered from an event like this is the press’s call. And it is striking that of coverage of the briefing (I counted around 15 or so stories), about 75% headlined the diversity point. The Court’s 11-1 gender ratio is clearly of interest to a goodish cross section of the mainstream press. And if that is the message getting through to readers from the Guardian to the Telegraph (and all points in between and beyond), the Court should be worried. Dr Richard Cornes (@CornesLawNZUK) is a Senior Lecturer at the @EssexLawSchool, and Associate Member of Landmark Chambers, London. This entry was posted on October 16, 2013 by Constitutional Law Group in America, Judiciary and tagged Common Law Rights, Human Rights Act Abolition, Human Rights Act Reform, Judicial Diversity, Legal Aid, Supreme Court, UK Supreme Court.